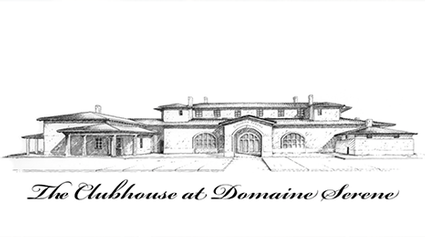 The Clubhouse at Domaine Serene is a true testament and a statement to the quality of Pinot Noir and Chardonnay being produced in the unique terroir of the Dundee Hills. 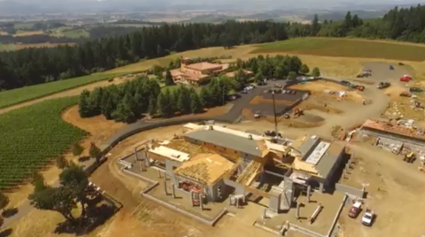 The Clubhouse is a gift to our cherished members, the wine community, and was conceived to celebrate the burgeoning Evenstad Family’s wine legacy for future generations to come. Founders and owners Grace and Ken Evenstad’s vision for the clubhouse drew inspiration from Château de la Crée, their 15th-century estate in Santenay, Burgundy – which they purchased in 2015. It’s thoughtful design, architecture and old-world construction techniques offer future generations of wine lovers the same sense of place and history found in the most significant and storied regions of Burgundy. 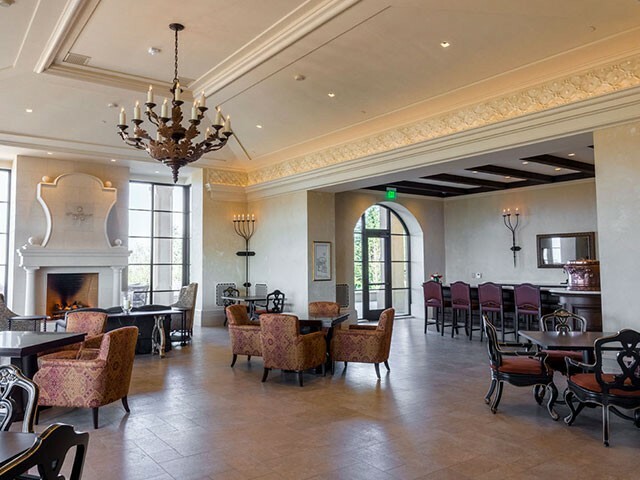 The Clubhouse at Domaine Serene features a spectacular grand room for public wine tasting, a members-only lounge and a dedicated food and wine pairing lounge all wrapped by a large patio that frames sweeping views of the Valley and the Coast Range. Underground, guests will find a one of a kind cave system modeled after the one found at the Evenstad’s 15th-century Burgundian property, Château de la Crée. Additionally, the chef-inspired commercial kitchen allows their top-tier executive chef to host both intimate and large wine dinners. 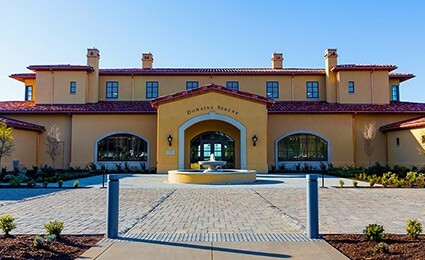 The historic old-world craftsmanship of the building reflects the authenticity of the wine-making philosophy of Domaine Serene. There is an appreciation for the use of quality materials lasting long beyond a lifetime. 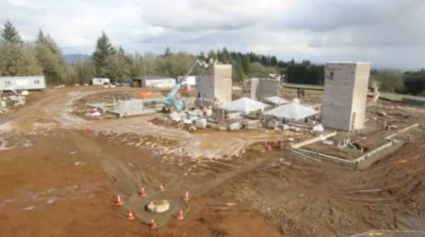 Many of the building techniques used have been around for generations. The building and design teams were careful to use the same approach to quality craftsmanship and effort that the Evenstads have put into their award-winning winemaking for decades. 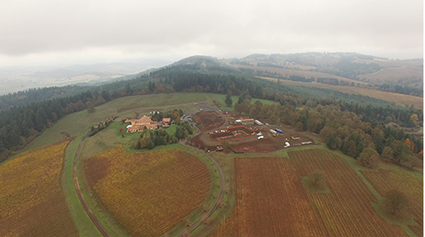 The Clubhouse is a sanctuary for Domaine Serene’s club members and visitors from both near and far, and lends credence to why the Willamette Valley was recently named wine region of the year by Wine Enthusiast. 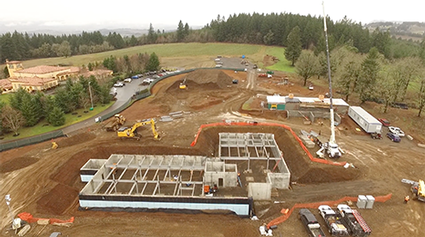 For more information on Domaine Serene and their new Clubhouse, please contact us today! 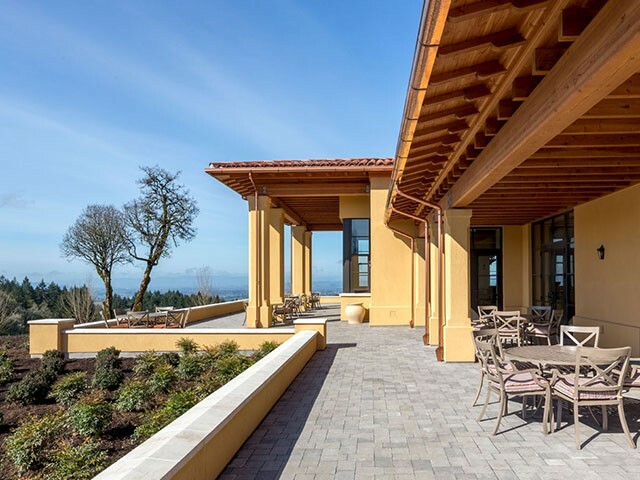 With gorgeous southwest-facing views over rows of vines, the surrounding Willamette Valley, and the Oregon Coast Range, our exclusive members-only space offers a unique blend of drama and intimacy. Visiting Wine Club members are treated as our honored guests arriving at a special place: classic, yet invitingly warm and graceful. 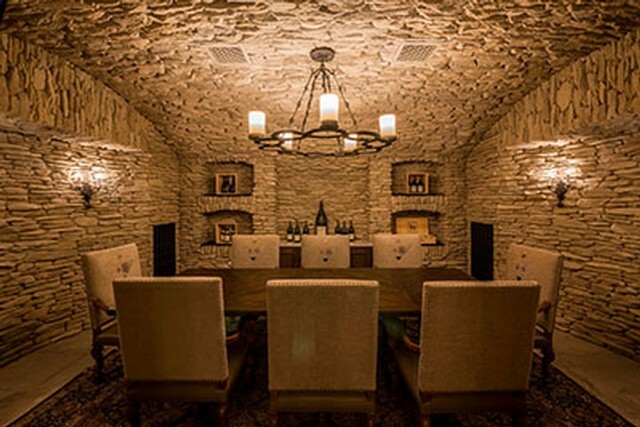 In the cellar of the Clubhouse, our dramatic wine Cave features a series of major and minor spaces, all very layered, cave-like, dark and mysterious. Stone-vaulted ceilings and subtle lighting provide the perfect ambience for contemplating the nuances of a great glass of Domaine Serene wine. Visit our Clubhouse and tasting room seven days a week to enjoy exquisite Domaine Serene wines while surrounded by our picturesque vineyards at our Winery Hill Estate. We offer tasting experiences for different occasions, from a casual drop-in tasting, to an exclusive, private tasting in one of our caves. Please note that we strongly suggest reservations to be made in-advanced notice of your visit! After entering the Clubhouse, guests find their way into an expansive yet elegant public tasting area. Straight ahead upon entering, an impressive 34-foot-long wine bar is backed by an enormous window. This south-facing window and the large terrace just beyond it look out over manicured vineyards in the foreground, with jaw-dropping vistas of the Southern Willamette Valley and Mount Jefferson in the distance. Make plans to join us as we celebrate the release of the 2016 vintage and library wines from our Burgundy portfolio - featuring selections from both our Château de la Crée and Maison Evenstad collections. The tastings will be conducted at 12:00pm and 2:30pm every Saturday and Sunday in the month of April. Please contact us today to schedule your experience! Please make plans to attend this extremely exclusive dinner featuring premier James Beard awarded and nominated Chefs! This opulent, multi-course dinner will feature the finest farm-to-table ingredients prepared by Top Chefs and meticulously paired with rare and exclusive Domaine Serene, Maison Evenstad and Château de la Crée wines. Guests can expect a unique evening at the Clubhouse at Domaine Serene that is guaranteed to delight the senses. The Clubhouse at Domaine Serene will be closed for our annual all company meeting on Monday, April 29th. Normal business hours will resume Tuesday, April 30th. We hope to see you then! Join us at the Clubhouse to kick off the summer season this Memorial Day! We are open for regular service all weekend with new releases and special library wines on each flight. Celebrate your Gold Eagle membership with an exclusive dinner at the Domaine Serene Clubhouse. This annual dinner is a celebration to thank our valued Gold Eagle members for their friendship and support. The festivities will begin at 6 p.m. with a lively reception, followed by a lavish seated dinner paired with our most exquisite wines. Please email or call to confirm that you and your guest will be able to attend. Join us for the first Domaine at Dusk of the season! We will be extending hours until 8pm on Thursday, June 6th and celebrating with local food vendors, live music, and your favorite Domaine Serene, Château de la Crée and Maison Evenstad wines by the glass or bottle. Show up early to grab your bottle of wine and enjoy the afternoon sun! Domaine Serene will be closed on the 4th of July. We will resume regular business hours on the 5th. Thank you - have a safe and fun holiday! We will be extending hours until 8pm on Thursday, July 11th and celebrating with local food vendors, live music, and your favorite Domaine Serene, Château de la Crée and Maison Evenstad wines by the glass or bottle. 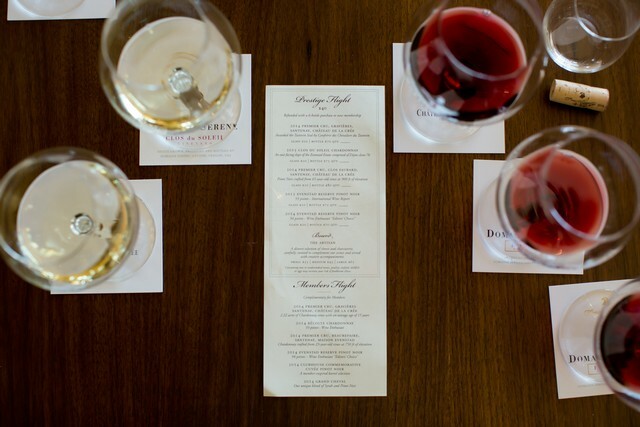 Join us on Bastille Day to celebrate French culture with special Château de la Crée and Maison Evenstad wine flights! Circle this date on the calendar and make plans to attend the highly anticipated release gala for the 2015 Monogram Pinot Noir and the 2017 Coeur Blanc White Pinot Noir. It is sure to be an evening of intrigue and discovery where we will be showcasing two rare and elegant expressions of Pinot Noir. Full details will be revealed in the coming weeks. We expect this event to sell out quickly so contact us today! We will be extending hours until 8pm on Thursday, August 1st and celebrating with local food vendors, live music, and your favorite Domaine Serene, Château de la Crée and Maison Evenstad wines by the glass or bottle. We will be extending hours until 8pm on Thursday, September 5th and celebrating with local food vendors, live music, and your favorite Domaine Serene, Château de la Crée and Maison Evenstad wines by the glass or bottle. In anticipation of the 2019 harvest, we would like to cordially invite you to lunch among the vines at our beautiful Two Barns Estate in the Dundee Hills. Attendees will enjoy an elevated lunch curated by the Culinary Team at Domaine Serene along with horseback riding, music and, of course, beautiful wines. Domaine Serene will be closed on Thanksgiving Day. We will resume regular business hours on the 29th. Avoid the Black Friday crowds and enjoy a seated Prestige Tasting or Estate Flight Friday through Sunday! Each year as a special thank you, we host a complimentary dinner filled with fine Burgundian wines and delectable cuisine for our valued Chevalier d'Or Wine Club Members. Members will enjoy an evening in the Clubhouse at Domaine Serene where we will create an exquisite multi-course menu paired with Maison Evenstad and Château de la Crée wines. This dinner is complimentary to Chevalier d'Or Club Members plus one guest. Space is limited so, we encourage those that would like to attend to contact us today to RSVP. Kindly RSVP by November 16th. Make plans to join us on Saturday, December 7th and Sunday, December 8th as we transform the gallery of the Clubhouse at Domaine Serene into an upscale Holiday market full of gift ideas for even the most discerning of palates. A variety of local artisans and beloved vendors will be on hand to help design the perfect gift for wine lovers looking for that special something for their loved ones this Holiday season. Personalized gift wrapping services will be offered along with custom bottle engraving for those looking to personalize their gift bottles of award-winning Domaine Serene, Maison Evenstad, Château de la Crée, and Les Tourelles de la Crée wines. The Clubhouse at Domaine Serene will be open for regular service during each Holiday market from 11-5pm. There is no cover to gain access to the gallery and vendors. A great turnout is expected, so we recommend making a reservation to secure a table for wine tasting or food & wine experiences. Domaine Serene will be closed on December 24th & 25th. We will resume regular business hours on the 26th. Thank you - have a safe and fun holiday! Toast to the New Year with Domaine Serene! Full details to be released soon. We expect this event to sell out quickly so contact us today.